Cream helps you get on top of your news feeds by skimming off the creamiest stories. Using techniques developed for junk mail filtering, Cream monitors what you read, and learns what you like. The more you read, the better it gets at tailoring content just for you. Cream is designed to be as lightweight as possible. If you want to read a story immediately, one click will open it in Safari. 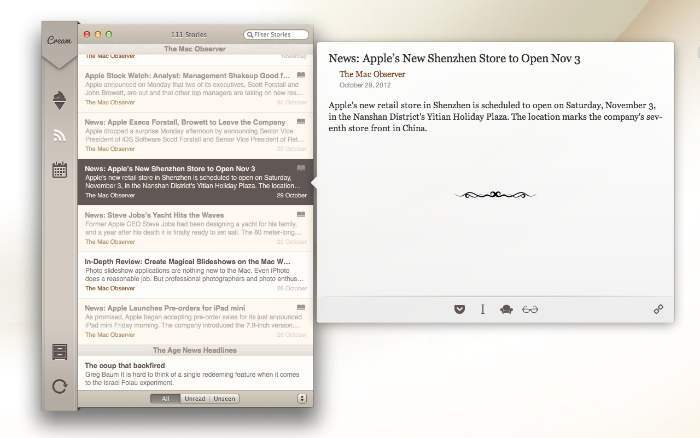 If you want to postpone, Cream has built-in support for read-it-later services like Pocket, Instapaper, and Readability, as well as Safari's Reading List. Subtle colors are used to highlight the best stories, and you can sort based on creaminess, source feed, and date. Filters allow you to sift out what you have already read or seen, and limit the number of stories displayed. Adding your existing news feeds to Cream couldn't be easier, because it includes built-in support for Google Reader. Just login, and Cream will import and process your feeds in a flash. Cream uses the same techniques used for junk mail filtering to sift out stories tailored to your taste. When you click on a story, Cream flags it as a good story. If you ignore a story that appears on screen, Cream will mark it as uninteresting. The text and links of the stories will then be scanned, and used to judge the creaminess of future stories. The beauty of this approach is that you don't have to do anything out of the ordinary. You simply read the stories that interest you, and Cream learns what you like, and helps relieve the burden of sifting through uninteresting material. Cream is pretty smart. It can learn whether or not you like a particular news feed (e.g., Daring Fireball), or a given topic (e.g., Presidential Elections), but it goes deeper than that. Cream can correlate different types of data. For example, Cream could learn that from all the stories in the Macworld news feed, you only like posts written by The Macalope.